L​e Tu Chinh (second left) and expert Loren Seagrave of the IMG Academy (third left). 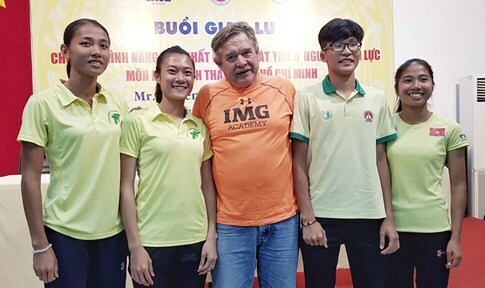 Hanoi (VNA) - ASEAN sprint queen Le Tu Chinh will begin a long training residence at the IMG Academy in Florida this December. Deputy Chairman and General Secretary of the HCM City Athletics Federation Nguyen Trung Hinh announced the news at a meeting in HCM City on October 27. At the Southeast Asian Games in Malaysia in August, Chinh won the 100m and 200m. The unstoppable 20-year-old then teamed up with Nguyen Thi Mong Tuyen, Tran Thi Yen Hoa and Do Thi Quyen to win the 4x100m in a time of 43.88, a Games record. During her training in the US, Chinh will compete in many tournaments to hone her skills and gain experience. Expert Loren Seagrave will oversee Chinh’s training. Seagrave coached Donovan Bailey of Canada to take gold and break the world record in the men’s 100m category in 1996. Seagrave was present at Thong Nhat Stadium in HCM City on October 26 to watch Chinh competing in the National Athletics Championship. Chinh said she will try her best to improve via training in the US to gain a medal at the Asian Games 2018 and win a ticket to compete in the 2020 Olympics.